That’s right! 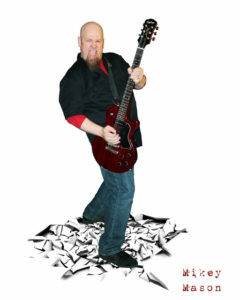 We’ve got Mikey Mason, the (in)famous Geek Comedy Rock Star performing at our inaugural BFGcon! If you aren’t familiar with him (for shame!) he is a singer-songwriter who is a self-proclaimed white trash geek. He has performed at huge cons such as GenCon and DragonCon, as well as played less geeky sets at venues such as the House of Blues. Even if you don’t know his name, you probably have heard some of his geeky hits such as Natural 20 or Best Game Ever. He’ll be doing two different sets for our schedule, on Friday and Saturday evenings at 7pm each, and attendance to the concert is included with your con ticket for the day! Mikey Mason is a comedy monster. A naughty cartoon character. An experiment gone wonderfully wrong. He explodes onstage with unfathomable energy, relentlessly pounding away at his audience with a wit as fast as his mouth, infectiously hilarious original songs, and his completely twisted world view. He’s the psycho stalker ex-boyfriend of comedy, except that you want to see him again. And again. And again. Make sure that you check out his website, Facebook page, and give more of his songs a listen on Bandcamp. But we warn you, you might just lose a couple days of productivity listening to everything! 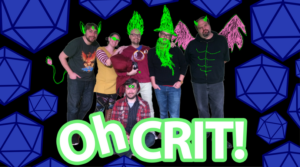 Join them as they embark on adventures untold, creating a story of twists and turns, bizarre characters, battles, unforeseen deaths and occasional epic failures… all with the help from you (the audience) and the whim of an unforgiving 20-sided die! They are a local performance crew, based out of Frederick, and will be performing for our attendees on Saturday at 6pm, just before the concert. Check them out on Facebook to see more of their crazy antics!